2 years of the same World Language are required for college entrance and graduation if the student plans on attending college. We offer 3-5 years in Japanese, German, French, Spanish and American Sign Language. Students must have prerequisite English grammar skills to begin a World Language. We offer an introductory course for students who are not ready for a full World Language course. We also offer Language Studies courses after 2 years have been completed. These courses are a continuation of language study without the rigor of a 3rd or 4th course. In these courses, the student will learn grammar of the language, verb conjugations, and pronunciation. The emphasis is on reading in French, vocabulary, culture, music, and geography. In these courses, the student will learn grammar of the language, verb conjugations, and pronunciation. The emphasis is on reading in German, vocabulary, culture, music, and geography. 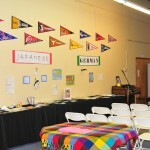 These classes will focus on basic grammar, speaking, and listening skills in Japanese. Students will learn to read and write hiragana, one of the alphabets used in Japanese. Students may also begin katakana, another alphabet. Japanese culture will be explored. In these courses, the student will learn American Sign Language including beginner/intermediate/advanced level vocabulary, sign language conversational skills, grammar and cultural aspects of the deaf community. In these courses, the student will learn grammar of the language, verb conjugations, and pronunciation. The emphasis is on reading in Spanish, vocabulary, culture, music, and geography.